Reception on Friday 5 December 2014 - 7:30 - 9:30 pm. The Thame Rotary Art Show took place at the Thame Barns Centre over the weekend 5-7 December. Proceeds from the sale of paintings, sculptures, and Christmas craft are in support of Rotarys causes: Thame SAFARI, Thame Skatepark Project and Thame Childrens Choir. The event was opened by Robert Duncan, the world renowned cartoonist and playwright. Robert, who lives in Long Crendon and is the father of Lotte Duncan, the cookery book writer, has been especially known for the world famous Not Particularly Orange range. The event was run by Thame Rotary Club and Inner Wheel club members, family and friends. Delicious home made cakes prepared by these groups were also available for sale. The Thame Rotary Art Show was another great success this year. From the moment James Duncan opened the show at the Preview on Friday 5th December until the doors closed on Sunday - the Barns Centre was busy with art lovers. We managed to raise over 1,600 for Rotary charities whilst putting on an excellent exhibition of mainly local artists. We are now looking forward to next year's show. We are grateful to all those who supported the event, local artists, Rotary and Inner Wheel Club members and last and not least all the members of the local community who visited our Art Show. 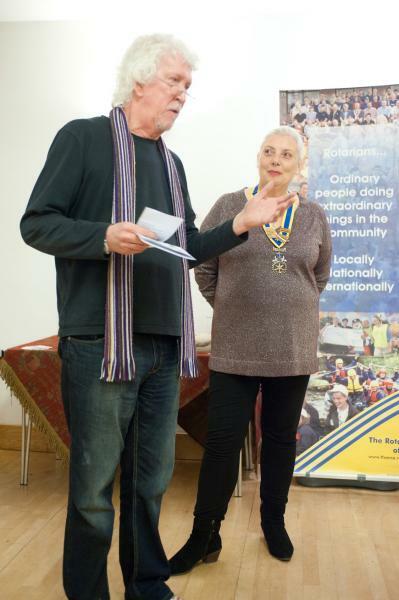 The Rotary Club of Thame has got its doors open to community minded people who enjoy helping running events like this and having fun at the same time. We are looking forward to hearing from you and meeting you. In the photo: Robert Duncan with Linda Emery - opening the Thame Art Show.